ANNCR: Bud Light presents…Real Men of Genius. SINGER: Real Men of Genius. ANNCR: Today we salute you… Mr Discount Airline Pilot Guy. SINGER: Mr Discount Airline Pilot Guy. ANNCR: Your minimal experience flying a plane will never land you at a reputable airline. Luckily, you don’t work for one. SINGER: Look at me, I’m flying. ANNCR: Sure, we’re concerned for our lives. Just not as concerned as saving nine bucks on a round trip to Fort Myers. ANNCR: The most direct route to Houston? Through Ft. Lauderdale. With layovers in Detroit, Vancouver and Kalamazoo. SINGER: I can’t feel my legs. 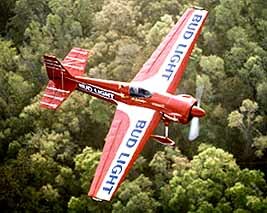 ANNCR: So crack open an ice cold Bud Light, oh, Skipper of the Skies. You put the ‘fly’ in ‘fly by night operation’. ANNCR: Bud Light Beer. Anheuser Busch, St. Louis, Missouri. This BUD is for you! AirTran Airways says it may stop serving Anheuser-Busch Cos. products on its flights to protest a radio ad for Bud Light that ridicules discount airlines and their pilots. The ad, part of the "Real Men of Genius" campaign created by DDB Chicago, is a comic tribute to discount-airline pilots, commending them for their "minimal experience" and for putting "the fly in fly-by-night." It also questions the safety of low-fare carriers: "Sure we're concerned for our lives," the announcer says - "just not as concerned as saving nine bucks on a round-trip to Fort Myers." Anheuser-Busch says it pulled the ad after one airing in January, but it has remained posted on an ad-industry Web site and recently made the rounds online among some pilot groups and airlines. It also has continued playing on Anheuser-Busch's phone system. AirTran Chairman and Chief Executive Joe Leonard sent a letter to Anheuser-Busch CEO Patrick Stokes on Thursday demanding an apology. "You may deem the commercial to be satirical, but I find it highly offensive," Leonard wrote. Hutcheson said the airline is considering dropping Budweiser from its flights. Other airlines said they, too, were outraged. "Totally tasteless," said Southwest Airlines spokesman Ed Stewart. "To joke about safety is awful. It's out of bounds." Anheuser-Busch, in a statement, offered an apology. "This campaign was meant to poke fun at slices of everyday life, but this execution clearly crossed the line and is in poor taste," said Michael J. Owens, vice president of sales and marketing.